For our first blog post, we are looking at an exciting innovation for supported decision making from Australia which popped up in our Twitter feed. 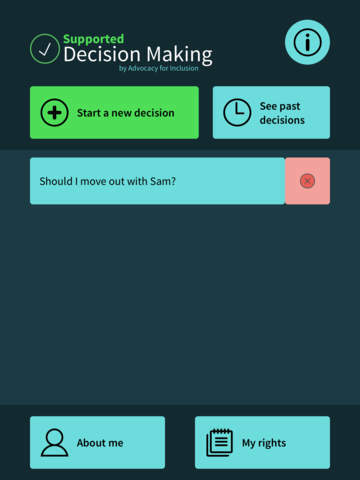 Based on the belief that everybody has the ability to make their own decisions and that we all need support from time to time Advocacy for Inclusion has launched the Supported Decision Making (SDM) App. The app is designed to take you through each step of the decision making process. It works for all levels of decision making from everyday decisions to life changing decisions and is designed to allow an individual to become confident in making their own decisions. Advocacy for Inclusion are an Australian organisation that provide both self and systemic advocacy services for people with disabilities in the Australian Capital Territory. They have previously been involved in trials for supported decision making and run inclusion and awareness training and a disability rights law centre.